After the “chunky Chinese red chile oil (taberu raayu)” boom, various kinds of chunky seasonings got popular including “chunky soy sauce” called “shoyu no mi,” which translates “soy sauce seed.” It is a type of moromi, main fermenting mash in production of soy sauce (see the picture below). The mash is usually disposed as lees but is commonly eaten in some regions such as Yamagata, Nigata, Nagano, and Kumamoto. Similar to the moromi, there is also moromi-miso, which is especially made to be fit to eat. 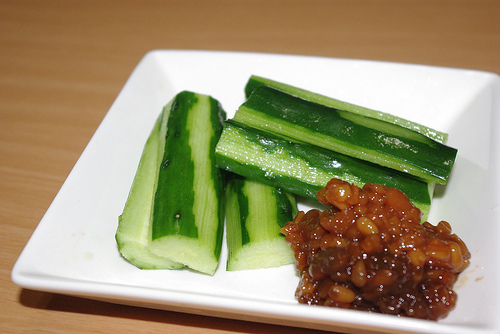 The top picture is cucumber with Kinzan-ji Miso, a famous moromi-miso in Wakayama and Chiba. Cucumber and moromi is a classic combination. The taste is like between soy sauce and miso, so it is good with most of the Japanese dishes. We simply put it on white rice, tofu, or eat as a relish for sake.